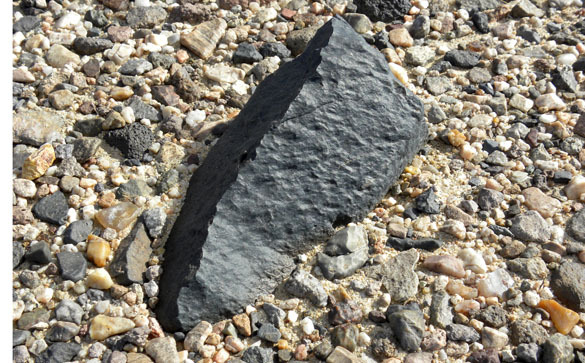 ZZYZX, CALIFORNIA–East of Barstow and west of Afton Canyon was a very large pluvial lake during the Pleistocene. This Lake Manix was hundreds of feet deep, and its catastrophic drainage through Afton Canyon about 185,000 years ago must have been a great spectacle. This afternoon we explored one of the southern shores of this ancient lake, and then climbed down through its eroding bottom sediments. Shoreline of Pleistocene Lake Manix. The dark rocks to the left apparently are remnants of an alluvial fan delta which extended into the lake shallows. The light-colored sediments below and to the right are from the lake itself. The white band in the foreground appears to be a type of coastal tufa formed by the agitated lake waters mixed with waters coming from the fan. Lake Manix bottom sediments consisting mostly of fine silts and clays. The plateau above the lake sediments includes windswept desert pavements and beautiful ventifacts (wind-carved stones) like this one. 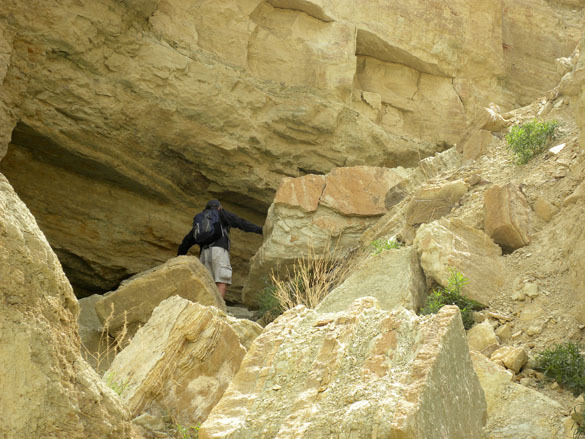 Greg Wiles explores the top of a wadi in Owl Canyon. 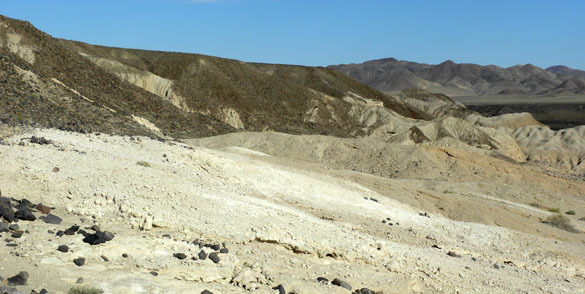 The debris here consists of blocks of Barstow Formation eroded during recent floods. ZZYZX, CALIFORNIA–It is hard to believe that the Mojave region once had vast lakes, erupting volcanoes and a diverse mammalian fauna including camels and horses. 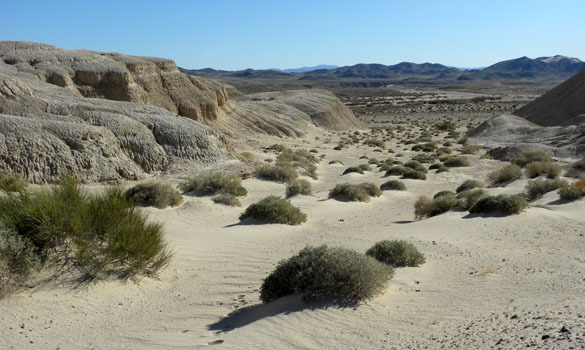 The most important record of this time is the Barstow Formation (Miocene — about 15 million years ago). This unit contains river and lake sediments along with volcanic ash, all of which produce a diversity of colors leading to the name “Rainbow Basin” for the best exposures outside Barstow, California. 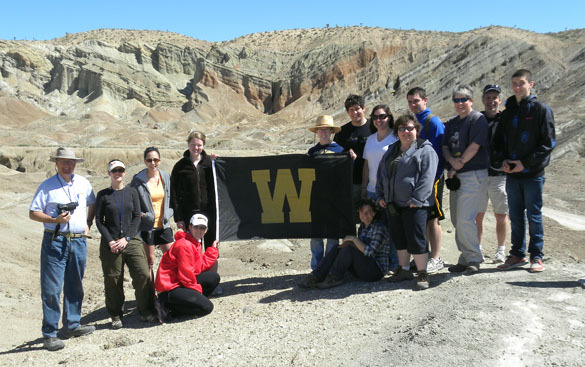 The Wooster geologists spent the morning with the Barstow Formation in Owl Canyon and Rainbow Basin. The highlights included a group analysis of dozens of rock specimens, a desert tortoise crossing the road, and meeting old friends Buzz and Phyllis Sawyer from Barstow. The Wooster geologists in Rainbow Basin with the Barstow Syncline in the background. Image by Buzz Sawyer.